The largest violet diamond unearthed from Rio Tinto’s Argyle mine in Western Australia goes on sale to tender this year. Violet coloured diamonds are extremely rare, the Argyle mine has produced only 12 carats of polished violet diamonds in the last 32 years. Around 90 percent of the world’s rare pink diamonds come from Argyle, according to Argyle sources. The diamond will “capture the imagination of the world’s leading collectors and connoisseurs,” said Josephine Johnson, the manager of Argyle Pink Diamonds. 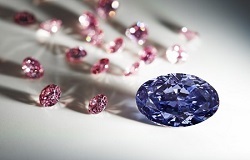 The 2.83-carat Oval diamond, known as the ‘Argyle Violet, will head up Rio Tinto’s 2016 Argyle Pink Diamond Tender, and will be shown in Copenhagen, Hong Kong and New York. The ‘Argyle Violet’ was polished in Western Australia from a 9.17-carat rough diamond discovered in 2015. The Gemological Institute of America GIA allocated a color grade of fancy deep greyish bluish violet.